We talked a lot about whole grains at the Shopping for Health conference this year, including ways to encourage shoppers to up their consumption to the recommended 48 grams, or 3 – 4 servings, each day. SFH sponsor Nabisco gave supermarket RDs lots of ideas for cooking demonstrations and other in-store activities that can educate both adults and kids on the need to consume whole grains. The goal of “making whole grains half of the daily grain consumption” is one in which most people fall far short.¹ On average, Americans consume less than 16g of whole grains each day. Fewer than 5% of adults consume the recommended amount and less than 30% of adolescents consume more than 8g of whole grains a day. Are you hosting a school group or other group of kids on an in-store tour? Send them on a scavenger hunt in search of whole grains. Challenge them individually or in teams to find whole grain products form the bakery, cookie/cracker and center aisles, all totaling up to at least 48 grams of whole grains. Start by showing the kids how to read the whole grain content on the front of the package or nutrition label. Shoppers may be surprised to learn the true size of whole grain servings. Display various 1-serving equivalents of whole grains, such as 1 slice of 100% whole grain bread and ½ cup cooked 100% whole grain pasta. Use common reference items to reinforce portion sizes – 1 slice of bread equals the size of an index card, ½ cup of cooked pasta or rice equals a tennis ball. The takeaway: 1 serving is equal to 16 grams of whole grain, and 48 grams of whole grain is needed each day. If space permits, have shoppers prepare their own pairings, creating snack ideas by combining whole grain products like crackers with an assortment of wholesome ingredients (e.g., fruit/vegetables, low-fat dairy, lean meats, spreads made with nuts/beans). Discuss MyPlate and the importance of choosing foods from the five food groups while participants are preparing their recipe. 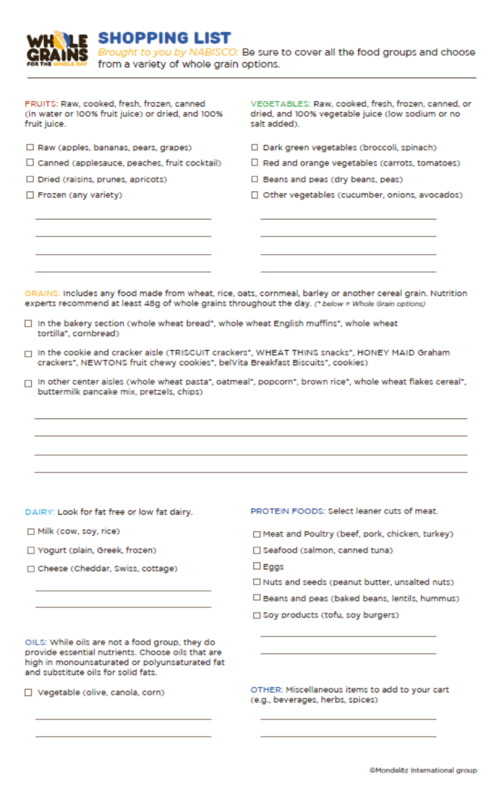 Finally, hand out a shopping list that customers can use as they are walking through the store, making sure they think about incorporating whole grain products into their meal planning. Here is a sample shopping list from Nabisco – download from the Shopping for Health web site to duplicate. ¹US Grain Consumption Landscape. Lin and Yen. USDA Economic Research Service. November 2007.